I haven’t had the privilege of reading Tana French but am putting this story at the top of my list! I am contemplating writing a YA mystery, but the police/suspect interrogation scenes have scared me off, so this sounds like the perfect read for me to learn and enjoy! Thank you for the in depth analysis! Why does the home page use the cover of Donna Tartt’s The Secret History, eh? Tom, good catch – we fixed. Secret Place narrowly edges out The Likeness because the farther away from it I get, the more preposterous The Likeness’s premise is. Faithful Place and Broken Harbor are essentially tied for last, but I put Faithful Place on top because Frank Mackey grew up 3 blocks away from where I lived in Dublin during grad school. What we can glean is that I liked detective teams and I like group psychology. I assumed Antoinette couldn’t solve the case mainly because of access–pressure to shut the case down quickly, class snobbery (the girls wouldn’t talk to her), a sexist partner and department that probably don’t believe a little girl could kill a young man, etc. She kicks herself repeatedly for not figuring things out sooner, but when your hands are tied there probably isn’t a lot you can do (even though she does have the insight into girls’ minds that Stephen requires to succeed. . . it’s a little bit like Remington Steele Syndrome. . . which might bother someone who isn’t such a pragmatist). My favorite parts of the book were the interviews–particularly Stephen’s last conversation with Joanne et al., when you get to see that her gang is just four girls feeling for some sort of power they don’t truly have (or understand). I wish she’d done more with the supernatural bit, but to go too far with it would have been too literal or off topic. Maybe it was just enough; a minor poltergeist born from the power of their friendship. I don’t know, I liked this one quite a bit, but the entire dynamics between the girls seemed like the retread of another work somewhere, didn’t it? Just wondering, does any one know who the protagonist of the next book is going to be? I wouldn’t mind a book (Say . after another 3 or 4), that had Holly as a rookie cop tell the story! Am I really all that out of order?! I think so. I really liked this book. I knew whodunit very early on, but that didn’t bother me. I still could hardly put the book down. I loved how the dynamics between the girs in the different groups was so realistic for teenagers and how this was essential for the solve (thats actually why I was able to solve it so early – because it totally made sense in their world). I did not like the supernatural bits. Like Edan, I preffered that there was a logical explanation to almost everything in the end as in Broken Harbor. Although I thought that there was a hint that it might just have been their Imagination. Does anyone agree? Rebecca and Selina seemed to border on psychosis anyway (would anyone like to discuss this with me?). So I thought maybe Julia and Holly just played a long or took over these smaller psychotic symptoms to keep the group together? 4. In the woods (I loved it during reading, but I really didn’t like that there was no solve – I kept going back over and over because I thought I missed something). I love Tana French, but for me the supernatural side of things was a little off-putting. I love how in Broken Harbor it was all explained, but not quite. Here I felt like we were meant to believe they were actually witches. Which felt a bit too YA for my tastes. There was the part where it dawns on Holly that some day she will be sure that it was all their imagination and I felt like that was the barest of hints that perhaps it was. But the ghost part only added to the silliness. I also agree that the Daleks started getting annoying once I realized their characters would develop no further. I also felt like Rebecca’s state of mind could have been developed further. As well as Holly’s character throughout. I felt like French spent so much time developing their unusual bond she dropped the ball on their individuality. Which may have been the point, but later it rang empty for me. I had the mystery figured out very early on and I was disappointed because I felt like it wasn’t hard to guess, because much like in The Likeness, it simply didn’t matter to French. The victim didn’t matter to French. All that mattered was this unusual bond and the magical powers it produced which was the goofiest element to the story for me. What I liked about it, was Detective Moran. He was immensely likable and it was fun to root for him. I also thought French did a masterful job of creating the most ridiculous and obnoxious teenage dialogue and yet giving it massive amounts of nuance and depth. Overall I always enjoy a new French novel, but on review I realize this wasn’t her best in my opinion. i struggled with The Secret Place. I felt that midway through, the girls’ dialogue bogged down so much that the plot failed to progress. Of course that’s often the problem with stories anchored in one place; the author has to dress and redress the setting, working to reveal something previously overlooked but somehow alluded to. I didn’t feel the detectives’ roles were a gender flip. I didn’t notice that the victim’s gender was also unique, but in retrospect I’m glad it wasn’t another helpless female. I’m looking forward to the next book – who will it be centered on? I’m hoping it’s a grown-up Holly. I totally did not get the ending…….what happened with selena and what did holly post at the secret place before she left. I’m really confused by what was going on with selena, am I missing something????? I found the secret place a teen ager harlequin romance been a long time since I found a book so boring! It went on and on and went no where. The Secret Place was kind of a disappoinment to me! I’m the opposite of you – I thought the teenspeak was WAY off (I’m a middle school teacher, so I hear probably too much of it daily) and distracting. Wow, I think I’m really different than everyone else! I hope the next book focuses on Antoinette! I felt that the supernatural powers were symbolic of the power of the girls friendship. Yes, that seemed like a hint when Holly thinks to herself toward the end that they will think they imagined it. This reminds me of the murder of the mom in the true story of Anne Perry and her friend. The characters had that same obsessed living-in-their-own-world type of friendship, and the threat to what they had could not be tolerated. I love all of Tana French’s books – love her psychological focus. In my opinion her books were getting stronger and stronger each time so I was really looking forward to this one. Secret Place seemed like a bit of a step back. For most of the book I didn’t really get into it until until the end with the last set of interviews where everything was being resolved which was very gripping. (Although I still don’t quite get why Selena suddenly dumped Chris… because they kissed once???) The supernatural poltergeist aspect didn’t help, that I found just silly. (In comparison to Broken Harbour where it worked better & was spooky.) Also the main character Steven Moran wasn’t very strong, I kept wishing she had focused more on Conway. This is a truly dreadful book. Really, really, awful. Long (too long) and simply boring. If ever there was a book not to be tossed aside lightly, but flung with great force, this is it. My first book by Tana French and very likely the last. I bought it in an airport in a hurry. Memo to myself: no more impulse purchases, do not read the appallingly dishonest quotes on the cover. This was sooo bad it’s motivated me, finally, to organize my TO READ list and to have a backlog on my kindle. It appears Ms French may be more popular with women, and I notice that most of the comments here are from women. Read this book and enjoyed it up until the ending. Would someone please explain it to me? I did not like “In the Woods” at all. Rob’s self-destruction is brutal to watch, and there is nothing to redeem him. It wasn’t tragic as much as it was total failure. “The Likeness” was rich and deeply steeped in description and character development. There was nothing wrong with its implausibility… The premise was laid out in the early chapters of the book and posed no problem for reading and enjoying the rest of it. “The Secret Place” had its moments, but something was off. I still enjoyed it thoroughly. “Broken Harbor” was haunting. A great read. That’s when a detective’s downfall is tragic, with Richie as opposed to Rob. As for “Faithful Place”, it’s a bit disappointing from Frank’s perspective. I expected more from him. 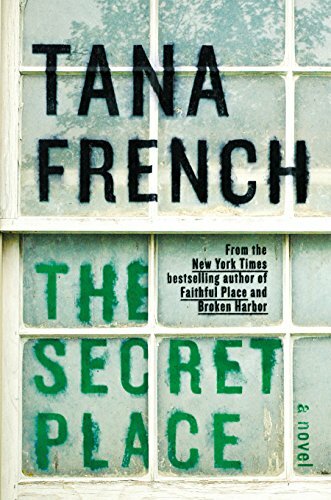 The secret place was the first book i read of Tana french. I do love the whole setting of the story and i was touched by the friendship between the four girls but sadly, their love to each others had turned out something tragic. one downside of the book was the superpower stuff, which i could barely understand what it means and it was not logical at all ! Besides, it did no contribute to the whole story and it could be deleted. I think Rebecca’s mind can be described in details as i didn’t fully understood what led her to kill. Furthermore, Becca had given Selena the Chris’s phone, there should be something on Selena’s mind(her mest mate killed her lover). I loved Conway and Holly the most because they seem tough and nothing could hurt them at lot but these two girls actually needed more love and care than anyone else. Can some discuss with me although it’s already 2016 and i was a bit late ! Why was Rebecca back at school like nothing happened? Did she get away with murder? I thought the secret place was confusing even to the end. I hated the supernatural bits. They made no sense and added nothing to the story. I did like the girls’ love and loyalty to each other, however. Can someone please explain the ending to me! Angie, I think you are confused. That next to last chapter where all the girls return after a summer away is actually the September previous to the start of the book, not the one after. it took me a moment too. Angie, Your comments regarding the supernatural episodes are spot on, I couldn’t agree more. The whole book was confusing to say the least and, for me, became quite unreadable towards the end. In the Woods definitely my favourite Tana French book!